Hello, I just changed my username from Baker- to now "Gymaholic." Working out and staying fit has always been something I've done throughout my whole life. However, I am now needing a new avatar and signature. 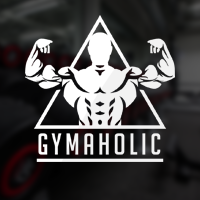 I want something super sweet with my new username in it "Gymaholic." Let's see what you designers GOT! Mediocre wrote Here you go, dude. Woah, your amazing. Do you have the links so I can upload them? Nevermind Mediocre, I got it taken care of. Once again thank you so much!